Fresh from touring Oz, one of the UK’s best hiphop DJs talked to us about how wack technology is, moving into production, digging, Kung Fu, and record crates more! First up, please introduce your goodself to our readers and tell us where you’re from. I’m the one and only Grandmaster DJ Sarah Love (hehe), and I’m born and raised in North London. And, I’m a resident DJ at the best party in the world today, Kung Fu! What first got you interested in hiphop and what’s your first memory of the UK scene? The hiphop seed was probably first sown by my sisters. I remember hearing stuff they were checkin. Run DMC, LL Cool J, Slick Rick. I remember being attracted to the attitude. I was feelin’ it. And when I was older, like 11, 12, my bro-in-law showed me the early/mid 90’s hiphop I still adore today. But it wasn’t like ‘oh thats cool, I’m gonna check that out’. Hiphop was always around really. First memory of the UK scene… probably record shopping if that counts, and then my days working at the original Deal Real Records with Pete Real. That was a bonafied hiphop community experience to me. Before that, it was just me on ma lonesome, sniff sniff. How long have you been DJing and what were the first turntables you used? I’ve been DJing out in clubs for about six years. Before that at different house parties, but that was a one record deck/cd/double tape deck/reel to reel tape machine type experience, so a little different to today. But other than the 70’s home system record deck, Technics 1200’s. I was blessed. What decks do you own now and how much time do you spend practising your skills? I don’t have any decks. Jus’ kiddin’. I’ve got a pair of ever-faithful 1200’s and I don’t spend nearly as much time as I would like practicing, partly ‘cause I’m moving about so much. But nowadays, I make sure I do something everyday. Even if it’s just 10 minutes. Are you interested in all the crazy technology that keeps coming out. CD decks or anything? I definitely find it interesting but I’m an analogue girl and I love the tangibility (is that a word? You know what I mean) of vinyl, and technology does my head in when it doesn’t do what it’s meant to for no good reason. See tapes, you press play, it plays. It’s beautiful. Tape chews, that’s about as bad as it can get. No diploma needed to work it out. I’m not fully convinced yet with the whole final scratch/serato thing. I like the visual aid of flickin’ through records too. I think it’s fascinating and exciting but there’s still teething problems that need to be ironed out for me before I’d move entirely to relying on it. And it’s a bit like cheating at times. And it kinda devalues the importance of the sound/production of music. And it eliminates so many values of hiphop. Sorry! Whats the world coming to ay? Nah, its all positive really. How big’s your record collection and what decent spots can you recommend to vinyl heads in London. Haha! Tryin’ to get ma diggin’ spots out of me ay? I really like this store called the Beathut near the bottom of Carnaby street on… I can’t remember the road, sorry guys! Autopilot takes over. It’s just mellow and they pick their selection well. New and reissue. I really dunno how many records I’ve got. I haven’t seen them all in one place for a little while now. But at the least, a couple thousand. Dunno! Do you plan your sets at all or just turn up with all your wax and decide the state of play as you go along? I’m a people watcher. You have to go with the vibe of the party. It can be difficult if you’ve turned up with bangers and it’s a chilled out lounge vibe (haha). That’s when you actually play that B side you’ve heard once in 10 years of owning a record but you just make whatever’s in your bag work. I don’t really have the time to plan out my sets, but I have tricks that I may have found by accident or thought about, that I may use in a show if I have those tunes with me. I know my records well now so I can remember tempos and things, which can act as a rough guide. What crowd pleaser records do you take to every gig without fail, and what’s your favourite break? Err, again it depends on what type of gig I’m doin’. Warm up, main set etc. If it’s straight up hiphop mainset, maybe ‘Witness’ Roots Manuva, ‘Burn/Shook Ones’ Mobb Deep, lots of Primo like ‘Nas is Like’. Stuff like that probably. And favorite break is very hard to answer. Instantly my brain is just like wow over load on information! 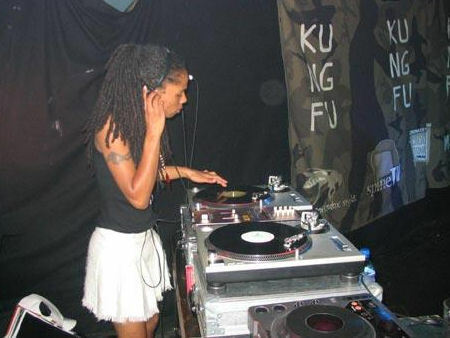 How did you hook up and become a resident DJ for KungFu and what’s been your best KungFu ever? So many wicked Kung Fu’s, always memorable for different reasons. Er, maybe the first Harry Love birthday bash in 2001. It felt like something special and historic was happening. It was the first time people had seen such a line up. Dupa Styles, Verb T & Red, Terra Firma, Taskforce, Braintax, Jehst, Poisenous Poets, Mystro, me and Harry. And I was able to actually go and enjoy the show in the crowd rather than sortin’ out this and that behind the scenes. Raekwon show, my valentines party with Taskforce and the Raw Dog band. And our 6th birthday party with Boot Camp Click the other day was another very special one. I became a resident when my friends Leo and Charlie said they were starting a night. They had DJs playin other stuff, jungle, garage and stuff and I was like, you need some hiphop in your lives. I wanna come and play! And that was how it all started. Is there any friendly competition between you and Harry seeing as your sets are often back to back? I don’t think so. I don’t think like that. We’re on the same team and we’re different y’know? We each do us! And I love hearing Harry play. I think if anything, I’ll be in awe thinking, ‘you badman!’. But ‘cause we have very similar taste, often we turn up with practically the same crates an’ it’s like, ‘I wanted to play that, I wanted to play that..’ but it’s all fun and games. How did you rate Jazz Cafe as the new venue? Reckon KungFu should head back to Underworld? But do you recon Kung Fu should go back to The Underworld Tee? Well, we’ve done a few things at Jazz CafÃ© but I dunno if it’s certified ‘the new home for Kung Fu’. But you know, wherever we lay our hat is our home an’ all. Wherever we are, there’s a bomm party goin’ on an’ that’s all you need to understand. Underworld was a beautiful thing when we were runnin’ tings there but in some ways we were limited. And being limited can block progression. But we don’t burn bridges so who knows where the future will take us? Aside from the regular KungFu nights, where can we hear your sets? All over the world mate! Nah, erm, I tour Australia and New Zealand quite often and I’ve played all over the UK and Europe. But obviously I’m London based so at all your favourite parties in the capital. And wherever you see Kung Fu my name is too. Check ma’ page Myspace.com/DJSarahLove or DJSarahLove.com (coming soon) and Kungfu-London.com all fresh ‘n’ new site in your face or your local listings to find me. What do you reckon to the current standard of UK hiphop and what artists or recent releases are you feeling? Okay… Well, I’ve been feeling quite saddened recently ‘cause there’s such little stuff that comes out that I feel prepared to play and I want something to play y’know! I aint playin’ something jus’ ‘cause it’s new or UK so for a DJ with high standards, it’s hard y’know? I’m dying for something to grab me and make me not rest till I have that tune, and that aint happened for a while. But… I love the new Verb T & Harry Love album ‘Bringing It Back To Basics’. I aint that biased but it’s the best ish out I know of. I love the Ransom Badbones stuff, Taskforce, Lewis Parker, Teef. I hear lots of promising material but I need a little more convincing, sorry! But I’m sure I’m probably over looking something I love off. Do you think you’ll ever have a go at producing tracks and what emcee would you most like to work with? Yes. I would love nothing more. I have the skills so I want to use ‘em. MC’s… Ghostface, Pharoahe, Redman, Big L, Chester P, Dead Prez. All my people, Verbs, Red, Mystro, Badbones… er… For me it’s firstly about people so if we connect then things can run. Is radio something you’d be interested in having a go at? I have and I enjoy it. Check ma’ CV bro… Jus’ kiddin’. I would love to have the time to dedicate to a regular radio show but right now my schedule and responsibilities don’t allow. But I’m always open to new opportunities. Outside of hiphop, what music and artists are you feeling most? People would be surprised, the music I’m into. Range is rather wide, from Metallica to Marvin Gaye. It’s like sayin’ think of a number… which do you pick? Benny Blanko, Che Fu, Luciano, Fela, Thelonious, Miriam Makeba, Ahmad Jamal, Stevie, Duke Ellington. I’ll get back to you with some more. Wanna drop any shout out’s or plugs to finish up on? Yes yes.. 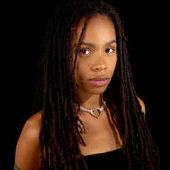 Check your new favorite site DJSarahLove.com soon come. Check the oh so fresh Kungfu-London.com site. Come say hi to me at Myspace.com/DJSarahLove (hehe). Look out for the new Kung Fu clothing range on its way summer 2006. Buy the Verb T and Harry Love debut album ‘Bringing It Back To Basics’ on Medication Records and anything you see with my name on. And I hope to see you soon party people! Pure love out to my Kung Fu brothers, my biological and non-bio sisters (you’re all the same now anyway!). All ma’ favourite DJs, artists and peoples in the world, Sarah loves you! Thanks for having me RapNews!